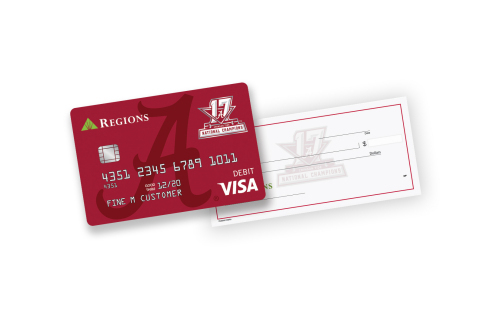 Regions Bank (NYSE:RF) customers can now celebrate the University of Alabama's 2017 College Football Playoff National Championship team by ordering and using commemoratively designed Regions Visa® CheckCard s or checks. As the official bank of the SEC for more than 25 years, Regions is honoring the National Championship win and letting fans show their pride by carrying the University of Alabama 2017 National Championship CheckCard or by ordering commemorative National Championship Checks. "Through our relationship with the SEC, Regions has been celebrating the accomplishments of its schools and supporters for more than 25 years," said Scott Peters, head of Consumer Services. "Now, we are pleased to be able to help fans of the University of Alabama celebrate their 2017 National Championship with these unique CheckCard and checks." The 2017 University of Alabama CFP National Championship CheckCard will be available for order beginning January 9 at a cost of $10. The CheckCard can be used with all Regions Bank consumer checking accounts. Total cost for commemorative checks may vary based on market and account type (discounts may not apply; price will be disclosed at time of order). Regions Bank is the official bank of the Southeastern Conference and offers a number of other specially branded CheckCards affiliated with colleges and universities. Regions Financial Corporation (NYSE:RF), with $123 billion in assets, is a member of the S&P 500 Index and is one of the nation's largest full-service providers of consumer and commercial banking, wealth management, mortgage, and insurance products and services. Regions serves customers across the South, Midwest and Texas, and through its subsidiary, Regions Bank, operates approximately 1,500 banking offices and 1,900 ATMs. Additional information about Regions and its full line of products and services can be found at www.regions.com.